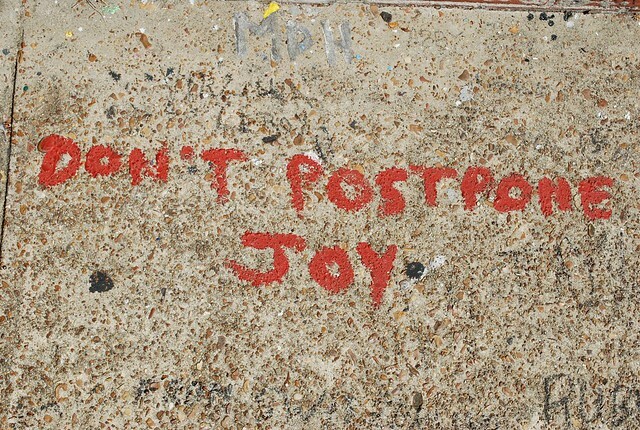 Jordy Liz Blogs: Don't postpone joy. It's hard to find joy when there isn't peace and it's hard to live a life of joy when you are constantly worried about what's next in the uncertainty of our lives. I struggle with anxiety and have so for the past six years. It comes and goes, sometimes unexpectedly, and while I think I know the triggers, they sometimes surprise me. In a restaurant. On a plane. When I'm by myself. When I'm in a large group. When I am suffering from anxious thoughts, I tend to seclude myself. I cancel plans and I pull myself away from people. I go to my room and I just stay put. All of this postpones joy. As I have become used to the anxiety and the triggers, I've learned how to handle it in a way that I don't always have to postpone my life to deal with it. I have learned to overcome it so that I can live a life of joy and not postpone it. It's hard, and not always certain, but I do know that a life of joy is so much more fulfilling than a life of worry and fear. We are all messy people. We fear. We cry. We worry. We want control. We are dripping with the messiness of life. But then God comes and cleans it up and lets us know it's okay to fear. It's normal to be afraid. And it's the hope in Him, in the midst of the panic, that brings complete peace and pure joy. Is there something that is causing you to postpone joy? I struggle with anxiety too. Sometimes I know how to overcome it, and other times it hits so quickly that there's really not much else I can do. Except for pray. And then I also find the complete peace and pure joy.